Founded in 1977, SCAN New York is a non-profit youth and family service organization that provides a variety of integrated supports to the highest risk children and families of East Harlem and the South Bronx. SCAN provides family-focused programming that uses a positive approach, harnesses individual strengths and fosters responsibility, self-esteem, initiative and the development of life skills. Several NYJL community committees work with SCAN including, Personal Empowerment Project, Reading Rangers, CHEF, and Girls’ Leadership Institute. 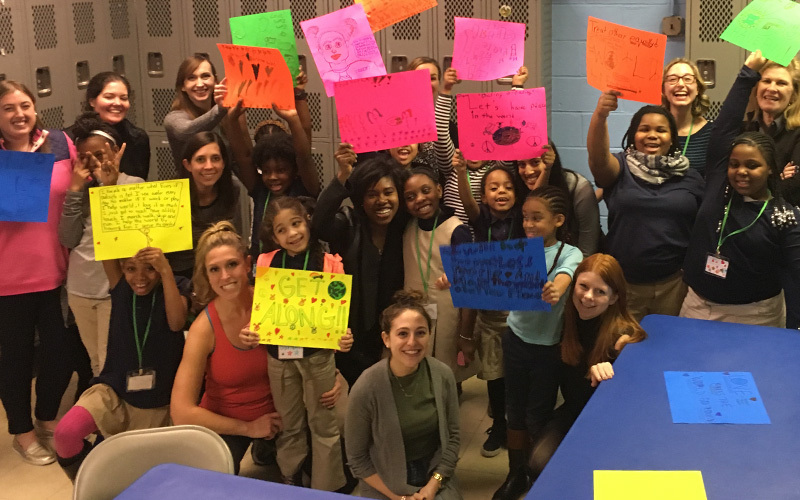 Girls’ Leadership Institute meets weekly at one of SCAN’s Cornerstone Community Centers located in East Harlem. NYJL volunteers foster confidence, self-respect, and community-mindedness to empower girls ages 7 to 11. In 2016–2017 Girls’ Leadership Institute held 24 workshops with a consistent group of 16 girls. On May 10, 2017, they held a graduation ceremony for the participants and their families. Each girl received a yearbook to commemorate her time at Girls’ Leadership Institute workshops.